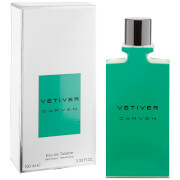 Discover Carven's Pour Homme Eau de Toilette; a distinctive fragrance for the contemporary man. Housed in a glass bottle dressed in black lacquer with a masculine silhouette and squared shoulders, the EDT combines fresh bergamot, grapefruit and orange blossom, layered over aromatic nutmeg, sage and violet leaves. Finishes with a woody, spicy base of vetiver, sandalwood and cedar. Top Notes: Bergamot, Grapefruit, Orange Blossom. Heart Notes: Nutmeg, Sage, Violet Leaves. Base Notes: Vetiver, Sandalwood, Cedar.